The Upside/Downside Ratio shows the relationship between up (advancing) and down (declining) volume. When the Upside/Downside Ratio is greater than 1.0, it is showing that there is more volume associated with stocks that are increasing in price than with stocks that are decreasing in price. Table 15 (originally tabulated through 1984 by Martin Zweig) shows all of the double 9-to-1 buy signals that occurred from 1962 to October 1994. As of this writing, no signals have occurred since the last one on June 8, 1988. 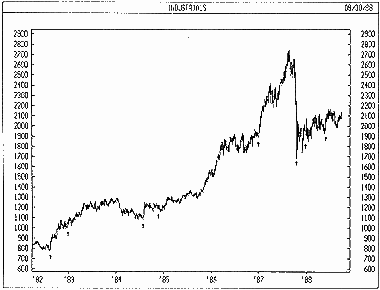 The following chart shows the Dow Jones Industrial Average during most of the 1980s. I drew “buy” arrows on the chart where double 9-to-1 buy signals occurred. The Upside/Downside Ratio is calculated by dividing the daily volume of advancing stocks by the daily volume of declining stocks. Shown here is the formula for the New York Stock Exchange (NYSE). Note: You can apply this same theory to any exchange.